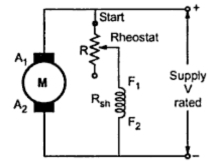 At the beginning the rheostat R is kept at minimum indicated as start in the Fig. 1. The supply voltage is at its rated value. 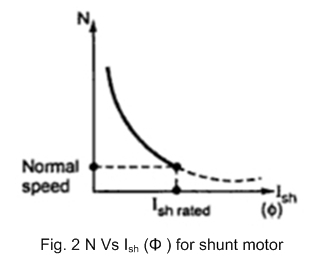 So current through shunt field winding is also at its rated value. Hence the speed is also rated speed also called normal speed. Then the resistance R is increased due to which shunt field current Ish decreases, decreasing the flux produced. As N α (1/Φ), the speed of the motor increases beyond its rated value. Thus by this method, the speed control above rated value is possible. This is shown in the Fig. 2, by speed against field current curve. The curve shows the inverse relation between N and Φ as its nature is rectangular hyperbola.